These beautiful wooden dog silhouettes are hand crafted especially for us by local Artisan Maker Mandy. 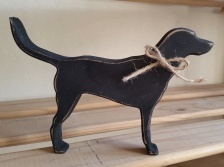 This beautiful black Labrador measures aprox 18cm nose to tail and stands 12.5cm tall. The perfect gift or keepsake for all dog lovers. Other breeds and colours available.